Situated just 450 feet away (2-minute walk) from the closest beach access, this 5-bedroom oceanside home within the Ocean Sands community of Corolla is the perfect place to spend your week-long escape to barrier island paradise. New to the Seaside Vacations collection for 2018, A Shore Thing boasts a prime location on a quiet cul-de-sac just one block away from the sun, surf and sand. Beautifully decorated and meticulously cared for by its owners, A Shore Thing offers bright and cheerful decor in a variety of beachy hues that are sure to make you feel welcome at your home away from home for the week. This Outer Banks vacation rental has recently received a series of updates throughout, including all new furniture, appliances, decor and flat-screen TVs, as well as new flooring on the top level and new carpet on the middle level. The only thing missing at A Shore Thing is you! Here you’ll find an open floor plan, which allows you to enjoy quality time with family and friends, whether you’re cooking in the fully-stocked kitchen, snacking at the breakfast bar, watching a movie on the brand-new flat-screen TV in the living room, or partaking in game night at the dining room table that comfortably seats as many as eight people. 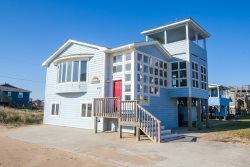 An elevator provides quick and convenient access to every level, and several large windows throughout the home let in lots of natural sunlight, contributing to the bright and airy atmosphere offered at this incredible Outer Banks vacation home. The gently rolling surf and wide expanses of sandy shoreline are within easy walking distance right down the road, where you’ll find a community walkway over the sand dunes and onto the beach. The Ocean Sands community swimming pool and tennis courts are also just steps away. If a community pool isn’t your style, you’ll be pleased to discover that A Shore Thing features its very own private pool in the backyard, along with a hot tub where you can relax after a day spent swimming, surfing or standup paddleboarding. Are you planning to treat your four-legged friend to a week at the beach? A Shore Thing is a dog-friendly home that welcomes your furry family member to tag along on your trip! Its location along a side street with no through-traffic offers a great place to safely take Fido for a stroll. If you’d rather embark on a longer journey, simply head for the wide pathway that lines the east side of the main road through town and extends for miles in both directions so you can explore everything Corolla has to offer on foot. A wide array of excellent Outer Banks restaurants, retail shops and attractions are also just a short distance from A Shore Thing. The popular Timbuck II Shopping Village—which is home to everything from fine-dining establishments, a pizza shop, fudgery and taqueria to a go-cart raceway, scenic putt-putt course and a company offering parasailing excursions—is just 1.5 miles from the house. The Currituck Beach Lighthouse—an Outer Banks landmark and must-visit attraction in Corolla—is just a 10-minute drive from A Shore Thing and will treat you to unparalleled 360-degree views of the Currituck Sound, Atlantic Ocean and famous Whalehead Club when you climb the 220 steps to the top of this 162-foot-tall red-brick structure. From its close proximity (150 steps!) to the pristine beaches and its beautiful, brand-new decor to its wealth of amenities and easy access to area attractions, this Outer Banks vacation rental is the perfect choice for your family’s next trip to coastal North Carolina. When you spend your upcoming Outer Banks vacation at this impeccable oceanside home in the heart of Corolla, having the time of your life and making memories to last forever is “A Shore Thing!” Book your stay today! Top-Level: Kitchen, living room and dining area. The living room has access to top-level deck and a fireplace. Mid-Level: 3 queen bedrooms, each with their own private bathroom, and new flat-screen TVs. Two bedrooms have access to the middle-level deck and hot tub. The master bedroom at the end of the hall has a dual vanity. This level features all-new carpets, along with a new washer and dryer in the hall closet. Ground-Level: 2 pyramid-bunk bedrooms, one with a video game setup including Wii and Xbox and direct access to pool area. One shared full bathroom. **Elevator access to all three levels. Exterior: Private pool, hot tub, park grill, outdoor shower, and fish cleaning table. The nearby community pool and tennis courts are available for guest use. NOTE: RVs, campers, trailers, and golf carts are not permitted at this property.